New Town signing Kazenga LuaLua is determined to prove a few people wrong during his time at Kenilworth Road. The 27-year-old penned a deal until the end of the season last week, after being without a club since leaving Sunderland in the summer. You just have to look at them and make sure when you’re on the pitch you prove them wrong that’s all you want to do. He had only made six substitute appearances for the Black Cats last term, totalling 116 minutes, while he also was with QPR, playing eight times. That followed a campaign where he had 17 games for Brighton and QPR, but on reports that he had been constantly injured during that time, he said: “The last few years, it’s weird as people see it as just injured, but it’s not really injured. “People think when I was injured, I was injured for a long time, but it wasn’t that. “I was coming back, the manager had a different option, every manager had a different option. “Many people have their own opinion, but you just have to look at them and make sure when you’re on the pitch you prove them wrong that’s all you want to do. Being out of work since his release had proved tough for LuaLua, as he said: “I have good family around me, my brother (Lomana) always pushes me on, as he’s been in the same situation before as well. “I don’t think it’s good for players, but you just have to keep working and you never know what’s going to come. When Luton came calling, it took time for the move to go through, but LuaLua admitted the chance to play under Nathan Jones was a huge pull. He said: “Yes, a lot, I know the manager from Brighton, he was assistant manager in Brighton. “From the first day when I came to training two weeks ago, it was nice and I did speak to the manager before I signed. On what he can bring to the Hatters side who are currently sitting in mid-table, LuaLua, who isn’t a stranger to League One either, said: “Some experience, to do well for the team, that’s the most important thing. “Work hard and it’s a team game, so hopefully we do well and I just enjoy my time here. 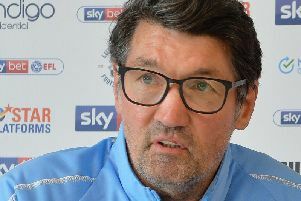 He doesn’t believe the club should look to stick around at this level for very long either, saying: “That’s the aim of the club (to get promoted), the aim of the players as well, so you want to push on. “I know they got promoted from League Two last season, are in League One now, you play to get promoted, that’s what you play for. When asked where he expects to feature for his new side, LuaLua said: “I am a winger, that’s my position, the gaffer here knows that from the time we had at Brighton. The former Newcastle wideman has been quick to leave an impression on new team-mates, as James Collins said: “He’s quick, he’s quick and sharp and you can tell he’s got ability. “If he gets at you, you’re in a bit of trouble, but he’s settled in really well.